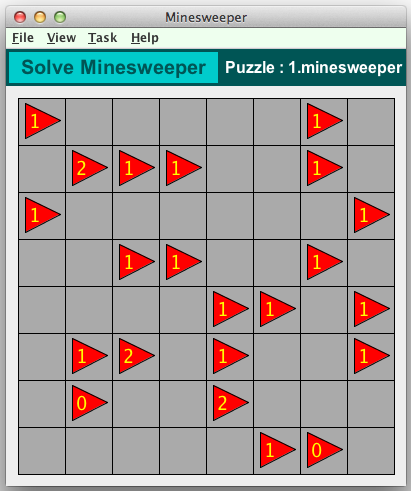 A MINESWEEPER puzzle consists of a square or rectangular grid in which a number of mines have been laid. Some of the cells contain a hazard flag which has a number indicating how many of the adjacent cells (horizontally, vertically and diagonally) contain a mine. To solve the puzzle, you must determine which of the unflagged cells contain mines. Each puzzle has a unique solution and no guessing is required to reach a correct solution. 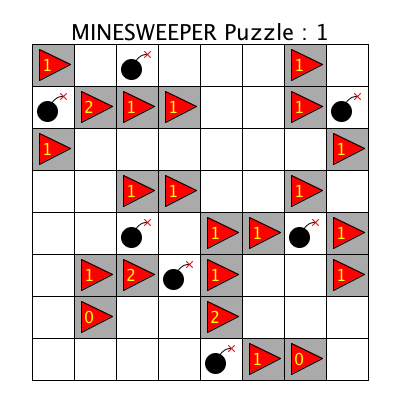 The following graphics show a Minesweeper puzzle in the Crossword Express Solve screen and a PNG graphic file produced by the program's print function, showing the complete puzzle solution. See also a full size version of a PDF file. Fully automatic construction of puzzles. Puzzles can be made in a range of square and rectangular sizes from a minimum of 6x6 to a maximum of 14x14. Four levels of difficulty can be selected when making a puzzle. Manual construction of puzzles is possible. This may be handy if you have a puzzle derived from a printed publication, and you want to turn it into a Crossword Express puzzle. Formatted output can also be exported from the Print screen to graphic files which conform to the BMP, GIF, JPG or PNG formats.